Everyone wants the new car look and feel. Whether new or used, protecting your investment should be an important part of your automotive maintenance routine regardless of its age. Picking the right products that will clean and protect your car is just as important as using the correct process when applying them. Follow these tips and tricks, and you can maintain your car like a pro without breaking the bank. Cars endure spills and stains throughout their lifecycle, but you can protect your car’s upholstery and keep it looking great with 303® Multi-Surface Cleaner™. This cleaner is great for removing a variety of spots and stains whether it be stubborn coffee spills, oils, grease, ink or the typical grime and dirt that vehicles endure. It rejuvenates surfaces without leaving a residue for a bright and clean interior. You’ve tried just about everything to get that stubborn spot out of your upholstery and nothing seems to work. Before giving up, try the high tech advanced formula in the 303 Spot Cleaner which can help remove even the toughest stains. The spot treatment is safe to use on all water-safe surfaces and materials. 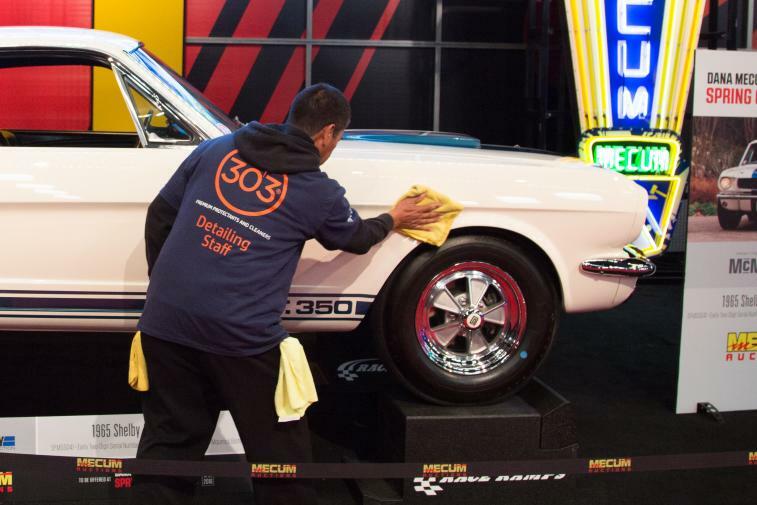 When you are looking to increase stain resistance and water repellency, 303 Automotive Stain Guard is the secret the pros use. It will maintain colorfastness while keeping fabrics comfortably soft and breathable. It is also safe for natural and synthetic fibers and on carpets and leather. Having your car detailed can be costly and time-consuming, but there are ways to clean and protect your car yourself that are quick cost-effective. To clean and protect all painted areas, plastic, fiberglass, metal and glass surfaces, try 303 Automotive Speed Detailer. This “detailer in a bottle” leaves a high-gloss finish and provides strong UV protection. Its spray on/wipe off application is extremely simple to use, helping you achieve a showroom shine in minutes. You look at your dashboard every time you are in your car as it is one of the most exposed areas of your auto. While there are products to help guard your dashboard, like screens and covers, the reality is that you can’t avoid exposure to the sun. The sun’s harmful UV rays can wreak havoc on your dashboard causing unsightly fading and cracking over time. To help protect your dashboard from the sun’s damaging rays, try 303 Automotive Protectant. This versatile protectant was created for the aerospace industry and is powerful enough to restore and protect your dash and keep it looking like new. It leaves no residue, repels dust and works as well on engine compartments as it does on interiors. It is a great solution for faded vinyl, rubber, plastic, leather and much more, and its UV protection lasts for months. When you are on the road, your windshield is the target of debris, bugs, bird droppings and many other gifts from Mother Nature. To help keep your windshield clean and your view clear, try 303 Instant Windshield Washer Tablets. These convenient tablets are environmentally-friendly and a great alternative to buying gallons of windshield washer fluid. The super-concentrated tablets are easy-to-use, and with three times the cleaning power of ordinary window washing solutions, they will keep your windows clean and streak free. So, before you rush out to the car wash or detailer, try these simple steps to help keep your car looking its best and your money in your wallet.